In an era when going away on vacation is not in the budget, many homeowners are finding it makes fiscal sense to turn the master bath into a spa environment with high-end amenities such as soaking tubs, saunas, whirlpools, granite countertops, double sinks, marble and tile flooring, and his and her dressing areas. According to the American Lighting Association (ALA), the finishing touch to a redecorated bathroom is complementary lighting that is highly functional and attractive. In response to the increased demand for luxurious bath amenities, lighting manufacturers now offer more high-end fixtures than ever, making this the perfect time to create a splashy bath. 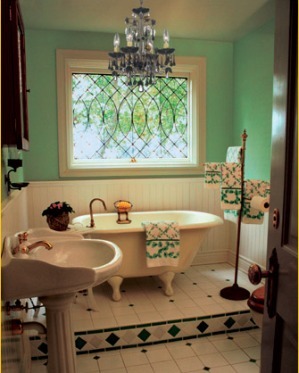 There are two must-haves for proper bath lighting: an ambient light source and task lighting. There has never been a better time to buy a decorative ambient fixture than right now. Lighting manufacturers have designed some truly elegant and highly functional fixtures that will set a luxurious atmosphere for the room and make your guests envious.”When selecting a decorative fixture, make sure you’re getting good light from it,” says Todd Phillips of South Carolina-based lighting manufacturer Quoizel. “Overall, soft contemporary styles are leading the pack. We’re seeing the importance of a bronze finish on clean designs. There’s been great growth in vanity sinks, which often have matching hardware. This has led to a desire for lighting fixtures in a complementary bronze finish,” say Phillips. “We’re also noticing a trend in faucets with an antique or brushed nickel finish.” Chrome is also a popular finish choice that will always be in vogue. The most critical area for proper lighting is at the mirror, where the majority of grooming tasks – from make-up application to shaving – takes place. Although many builders and interior decorators install one recessed light over the sink, lighting experts say this is not ideal for putting your best face forward. “The best scenario at the bathroom mirror is a lighting fixture at the top and two smaller wall-mounted fixtures located on either side of the mirror,” explains architect Joe Rey-Barreau, education consultant for the ALA, and an associate professor at the University of Kentucky’s School of Interior Design. “It is possible to add a recessed light over the sink as a supplementary light source, but it should never be the primary light because it will create shadows on the face. Decorative sconces that either match or complement the over-the-sink light will evenly illuminate both sides of the face. Rey-Barreau recommends a minimum of 150 watts of incandescent lighting per sink, or 40 watts of fluorescent. “An alternative to a compact fluorescent is the halogen IRC by Osram, which is low-voltage and provides 28 lumens per watt. It gives a lot of light and gives good color so that skin doesn’t look washed out,” says Paul Eusterbrock of Holtkoetter International, a lighting manufacturer based in Minnesota. “People need energy-efficient light that helps them look good,” he says. And don’t forget a dimmer. Dimmers are essential for creating a soothing and comfortable environment. Installing a dimmer in your master bath is one of the easiest, least expensive and mood enhancing techniques you can do. A lighting specialist at any Hortons Home Lighting showroom can explain all of the many options available for beautifying your bath.